When presenting our design proposals for your golf course, we can offer you more than just blueprints and verbal ideas to represent our design. We can now present our plans for your new course in a 3D rendering! 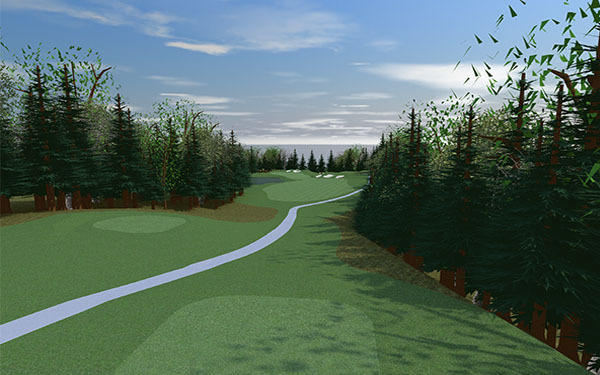 We do this by using a combination of programs to fit your unique needs, offering 3D renderings of standout holes or other impressive features of your course. We understand there are often many investors who will be working together to make the course of your dreams come together. This is why we offer these superb renderings, to help you get as many people on board as possible with an impressive and clear cut understanding of our course design. You might be wondering, what is a 3D rendering? To put it simply, a 3D rendering is a two dimensional graphic representation of computerized model that has been brought to life with the use of texture, colors, and materials. 3D renderings have become prevalent in our lives, even if you have not noticed. A large number of advertisements, animations, artwork in magazines, in books and on television, are all built around or from 3D renderings. 3D renderings are a unique and detailed way to bring your visions to life. This is especially useful in our line of work. We understand that often times you are working with a large number of people to fund and complete a project as large as building a golf course. Having a 3D rendering to represent your plans for the golf course can be a much easier way to generate interest from partners and investors- because if a picture is worth a thousand words, a 3D rendering is worth a million. We can go through the course, highlighting the best features, the most dynamic holes, or to explore the unique landscaping plans you have in mind. We are able to walk you through parts of the course, showing you a realistic representation.